But Chicago has so much to offer everyone who visits - it's a shopping weekend, a great city for sightseeing, a chance to enjoy some musical theater or a play, or just relax along the lakefront. 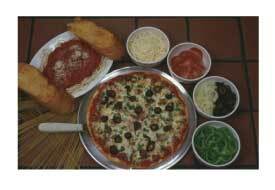 And, of course, there's the pizza! Getting to Chicago for a weekend getaway is relatively easy. There are, of course, 2 airports that serve the city - but for a weekend, I'm assuming you're living close enough to drive. Have you considered taking the train? Amtrak arrives at Union Station, located just west of the loop, with plenty of buses and taxis to take you where you need to go from there. 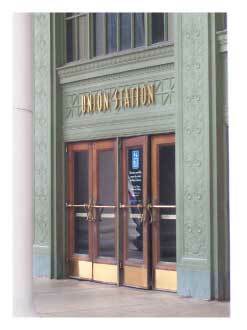 I love Union Station - it's a grand old train station with a wonderful lobby. OK, the benches in the lobby aren't comfortable and they're too far from the train platforms to be practical for getting to your train on time - but it is such a glorious example of the architecture of the city! If you drive into the city, there are several interstates that come into downtown. Park at your hotel and then use the bus system or "el's" (elevated trains) that traverse the city. If you're focusing your weekend along the lake, from Lincoln Park to the Field Museum, the #151 bus will take you any place you need to go! There are a wide variety of hotel options for a Chicago weekend getaway. 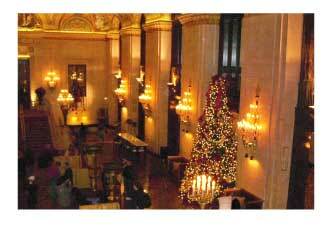 One of my favorites is The Palmer House Hilton (at right, decorated for Christmas). 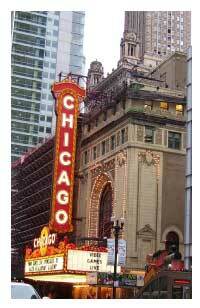 It's right in the loop, within walking distance of the theater district. It's a lovely old Victorian hotel - which means the rooms are small, but the charm and sense of old-time elegance makes up for it! There is shopping in the area, but State Street shopping isn't what it used to be. You can easily get to Michigan Avenue, but hop a bus or take a cab - it's a long walk, and you'll have too many bags to haul back to the hotel! For a nice, budget hotel a block from Michigan Avenue, try the Inn of Chicago Magnificent Mile. It's small and certainly not luxurious, but within walking distance of Michigan Avenue and only a few blocks from Water Tower Place - and rates are often less than $100 a night! There are tons of things to do for a Chicago weekend getaway, but you only have a couple of days! Chicago is a great city for sightseeing. The history, the architecture, the public art, and the ethnic groups that make up the city are all worth exploring, whether on a walking tour or on your own. Viator offers a walking tour of Art Deco buildings in the Loop area; Chicago Food Planet offers walking tours exploring food and culture (these are tasting tours - my favorite!). Public art is everywhere in downtown Chicago; Millennium Park is a great place to visit to take in much of the best art available. Located next to the Art Institute, Millennium Park is home to the giant silver "jelly bean" sculpture that Chicago has become famous for (its proper name is "Cloud Gate"); the image at right was taken from beneath the sculpture. The reflection-on-reflection effect is amazing! 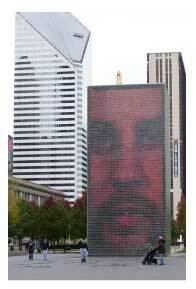 It also has what I call the "talking heads" (the Crown Fountain Towers), projecting images of local residents from glass block towers with water cascading from above. There's more art in Millennium Park, and much more throughout downtown Chicago. The Museum of Contemporary Art is near Water Tower Place, and the small park across the street has some very cool metal horse sculptures that look like they were made of twisted vines. 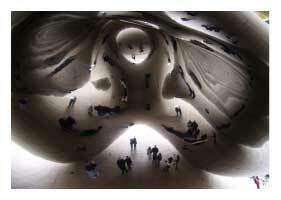 Look for art in every nook and cranny as you explore Chicago! My Chicago weekend getaway often starts with the theater. I love musical theater, and there are always several options in the theater district (in the Loop). 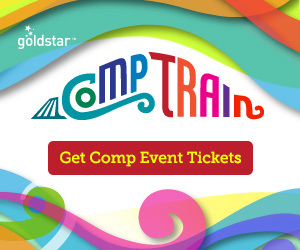 There are Broadway touring productions at the Ford Center for the Performing Arts and the Bank of America Theater, regional productions at the Goodman Theater, music acts at the Chicago Theater, and comedy at Second City (which is farther north, but easily accessible). Finally, there is, of course, plenty of shopping to do during a Chicago weekend getaway. It's a great destination for a shopping weekend! Michigan Avenue is home to virtually every major upscale department store in the country, from Nordstroms to Bloomingdales. And there are lots of boutiques, especially on Oak Street (near Water Tower Place). You could spend a year's income in a 4-block area around Water Tower Place! If you have young girls in your family, stop at American Girl Place, also just a couple of blocks from WTP. And while you're in the neighborhood, hit the John Hancock Building for spectacular views of the city! OK, you have to have the pizza! Chicago-style pizza is more than just deep-dish; every pizzeria has it's own recipe, and they're all great in their own way. Eduardo's or Giordano's has stuffed pizza, a double-crust version that's at least 1 1/2" deep, with tons of cheese, sausage, and other goodies jammed between the crusts. These are my favorites! Gino's has a unique single-crust with cornmeal as part of the mix; Pizziera Uno is well-known for their classic Chicago-style deep-dish. But try any pizza place you see - they're all pretty good, and it's not a Chicago weekend getaway without pizza! 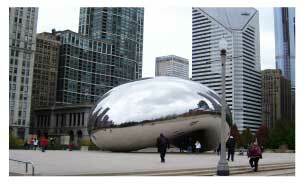 "A Chicago-style hot dog is a steamed or boiled, never broiled, all-beef hot dog on a poppy seed bun... The hot dog is topped with mustard, onion, sweet pickle relish (usually a dyed neon green variety called "Nuclear Relish"), a dill pickle spear, tomato slices or wedges, pickled sport peppers, and a dash of celery salt... Ketchup is never used on a Chicago-style hot dog." Portillo's is one of the best-known hot-dog joints; but again, you'll find the classic Chicago dog at any hot-dog stand in town. The downtown location has a 30's gangster theme! You'll also find Italian Beef sandwiches at Portillos, another Chicago standard. There are many, many good restaurants in downtown Chicago, but if you're staying at the Palmer House and going to a play, have dinner at the Berghoff on Adams. This fine old German restaurant has old-world elegance without the really exorbitant prices, with classic German dishes and lighter, contemporary fare as well. And their own brand of beer! Chicago is one of my favorite cities, and I like to visit often. If you've never been there, plan your next getaway in the Windy City!